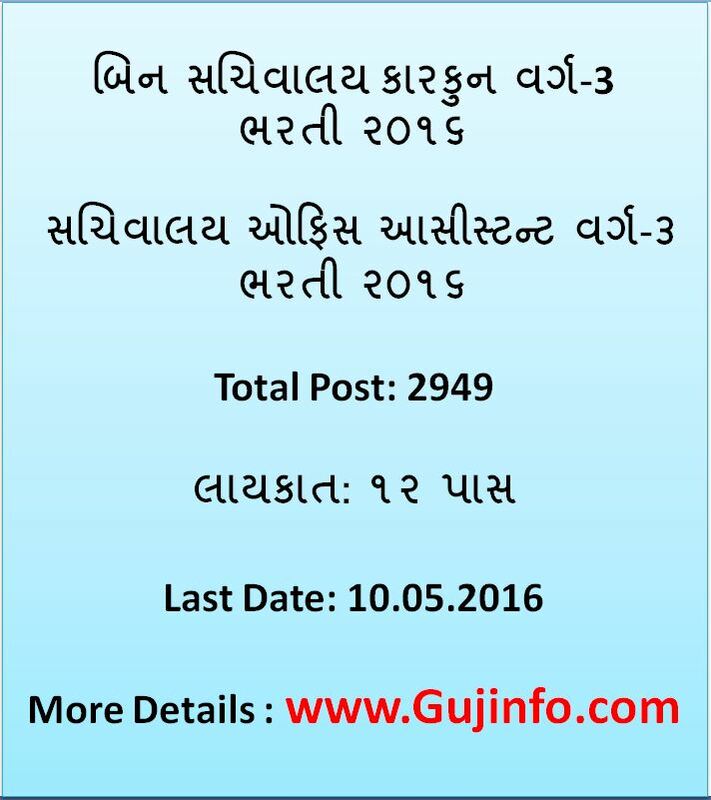 Bin Sachivalay Clerk Bharti 2016 for 2949 Clerk & Office Asst. Bin Sachivalay Clerk Bharti 2016 for 2949 Clerk & Office Assistant Posts Notification Along with Application form now available at ojas.gujarat.gov.in Subordinate Service Selection Board, Gujarat has recently announced an official GSSSB Recruitment 2016 Notification on gsssb.gujarat.gov.in regarding 2522 Bin Sachivalaya Clerk and 247 Sachivalaya Office Assistant Vacancies. All the interested applicants have to submit the Bin Sachivalay Clerk Recruitment 2016 Online Application form till 10th May 2016. All the applicants must read the notification before applying for the GSSSB Binsachivalaya JObs 2016. About GSSSB: Gujarat Subordinate Service Selection Board is known by its short name GSSSB is working for the state government of Gujarat. GSSSB release notification every year for recruiting new candidates in various government sectors of Gujarat state. GSSSB conducting written exams, skill tests and personal interviews for recruitment energetic, skilled candidates. Age Limit: 18 to 33 years as on 10-05-2016. Application Fees: Rs.100/- & Rs.12/- Postal Charges. How to apply: Eligible candidates may apply online through website ojas.gujarat.gov.in or gsssb.gujarat.gov.in from 22-04-2016 to 10-05-2016. Fill all the mandatory details in the application form and Submit. Upload scanned photograph & signature, click on confirm button. Take printout of application form and retain it for future reference.